This mixed media piece by Kassandra Pineiro generated a lot of interest. C. Chase Blanchard Easley's paintings "Mosaic," left, and "Dream Thyme"
Christina Young 's ceramic piece, "Piderpus," requires watering. 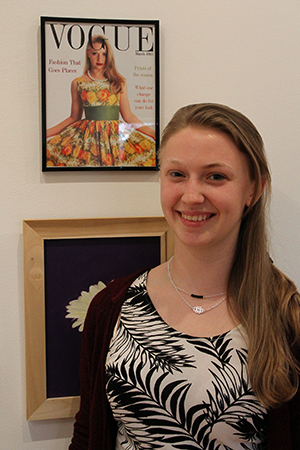 West Windsor, N.J. – Visual Arts students at Mercer County Community College (MCCC) have given visitors to the MCCC Gallery plenty to ponder and appreciate in the annual “Visual Arts Student Exhibition” at the Gallery at Mercer now through Thursday, May 4. 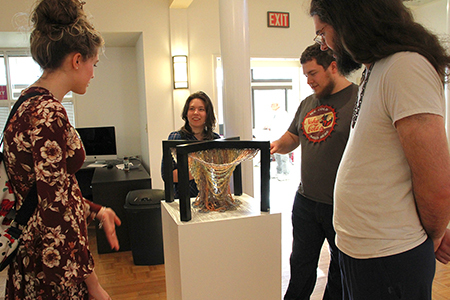 An opening reception on April 12 provided an opportunity for art students to gather and share work with classmates, family and friends. The Gallery is located on the second floor of the college's Communications Building on the West Windsor Campus, 1200 Old Trenton Road. Gallery hours are Mondays through Thursdays, 11 a.m. to 3 p.m., with Wednesday hours extended until 7 p.m. The show is free and open to the public. Visitors will find 65 works by 44 students, ranging in media and subject matter. Take Michele Bouchard’s “Election Still Life” acrylic painting, which offers a wry take on this past November’s election, or Katja De Ruyter’s abstract oil painting entitled “Mysterious,” which pulls viewers into another world. Students hail from all of Mercer’s Visual Arts programs including Fine Arts, Advertising and Graphic Design, Digital Arts, Photography and Sculpture. Most of the works in the show were created as class projects. Completing an assignment that required a self-portrait, Photography major Danielle Rackowski took a series of portraits with a timer, a prism and a shifting light source. Her photo in the show, entitled “Prism 6,” was the best of approximately 50 shots she took in changing light conditions. The photograph was bought by a patron at the opening reception. “I’m surprised and so pleased,” Rackowski said, who graduates in May and will transfer to The College of New Jersey to study photography and videography. In an assignment in which students were asked to create a piece that was inspired by the work of a famous artist or designer, Graphic Design student Julia Cook selected the late Cipe Pineles, an Austrian-born graphic designer and art director who rose to prominence at New York fashion magazines in the mid-1900s. Cook’s Vogue cover is spot-on in its depiction of the famed magazine, with the added personalized touch of using herself as the cover model wearing her grandmother’s dress from the 1960s. 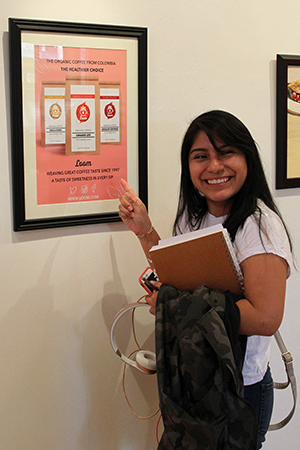 Another Advertising and Graphic Design student, Cindy Zumba, created a digital photograph featuring organic coffee with a variety of flavors of her own imagining. “The assignment was to create our own brand. I gave the poster an organic feeling,” she said. Zumba plans to continue her studies at the School for Visual Arts after graduating from Mercer in May. Sculptures in the show offer form, fun, and, sometimes, functionality. 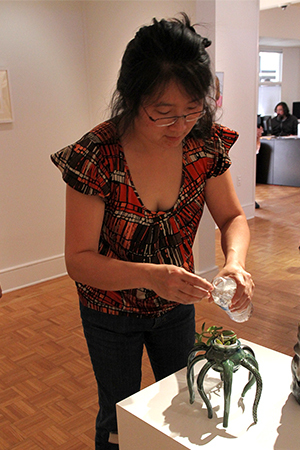 Ceramicist Christina Young created two pieces for the show – one is a jar and the other is a vase in which she planted a succulent that requires watering twice a week. 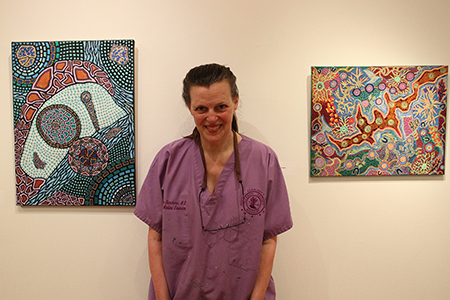 For more information about this and other exhibits at the MCCC Gallery, visit The Gallery at Mercer.